This hack tries to be a little upgrade from R/B/G without being too ambitious, also it makes some references to the TV show but in a different way than Pokémon Yellow. All Pokémon sprites will have an improvement/original sprite but still be loyal to the Classic Gameboy format; that means it will not have Full Color improvement or bigger backsprites, but the backsprites will be better and maybe some palettes could be changed. Mostly the whole game will have a lot of graphic updates. -Individual sprites for trainers/pokémons in overworld. -I hope to add at least 3 new minigames inspired on other games. -Make a new introduction sequence before the titlescreen. Currently I'm not much experienced with hacking, but I'm making my own progress and expect to add that in future releases. Celadon City is my favorite city in Gen I, this is a very personal hack. Also most of the greatest events are supposed to happen there. Most probably not. Pokémon Black it's reaching the end. Still, I'll be focusing on collaborating and working with Ax461 to give all of you the best version as possible. This is more like a side-project that sometimes I dedicate time. Looks very cool so far! That is definitely the best custom SGB border I've seen in a hack. Is that a mockup or is that already in game? 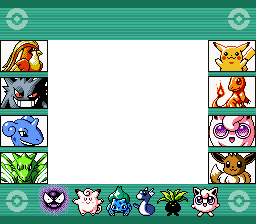 Most of the sprites are ripped off from Pokémon Pinball, I thought they could fit well in a SBG Border. Still, most of the images (Included the border) probably will be improved, haven't add the "Celadon" in the border yet. This is an interesting little hack. I think I'll follow this one. I would guess the bottom row might have to be drastically simplified. And the Pokemon on the left and right sides could be cleverly selected so that they could all share 3 palettes total, like how Pidgeot and Charmander could definitely be made to use the same palette in your example.